Round diamond weights vary greatly. Diamond size can be misleading, and understanding the tricks to finding round diamond weights can help couples learn what carat size is best for their budget and style preferences. A diamond's weight - often synonymously used to refer to a diamond's mass - is measured in carats and is one of the most critical gemstone characteristics for judging diamond quality. Larger stones are rarer, and many couples are interested in bigger, more glamorous stones. This is where understanding how round diamond weights are compared is valuable. The first distinction a couple needs to make is to compare the center stone size with the total carat weight of an engagement ring. The center stone is the one gem that is highlighted in the ring, whereas total carat weight refers to the combined weight of all the gems in the ring, including accents, side stones, and diamond chips. Many retailers may market bridal set engagement rings and other multi-stone designs under a single size quote, but further investigation will reveal that they are referring to the total weight and the individual size of the central stone may be significantly smaller. Round diamond shapes are the most popular choice for engagement rings because of their classic elegance and the fact that the round brilliant diamond cut maximizes the sparkle and beauty of the stone. The cut does not, however, maximize the visual appearance of the stone's size. The weight of the diamond is spread throughout its geometry, which means that a gem with twice the measured weight does not appear to be twice the visual size of smaller stones. Couples who want a visually maximized diamond should investigate elongated shapes such as the marquise or the emerald. Couples interested in a specific diamond weight, such as a one carat engagement ring, can consult with jewelers to find rings in that size. Online jewelers often have advanced search options for couples to select their desired diamond weight. In certain circumstances, a couple may already have an engagement ring - such as an heirloom ring -- but be curious about its diamond weight. Because every diamond is proportioned for its unique beauty, the most precise way of finding round diamond weights is to consult an experienced jewelry appraiser for a detailed analysis. This may involve removing the diamond from its setting to determine its exact measurements, but the results will be far more accurate than cursory examinations. How big is your diamond? Settings: A very open setting such as a cathedral setting or tiffany setting can make a diamond appear larger, while more discreet settings such as bezels or channels minimize size. 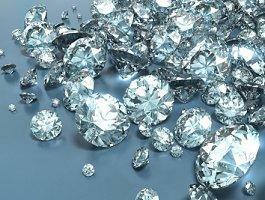 Metal: Depending on the color of the diamond, the type of metal used may help enhance its size. Bright white metals such as platinum and white gold can make a diamond seem larger, while darker metals such as black titanium can make the stone seem smaller. Accents: How accents are incorporated into an engagement ring setting can make a central stone seem larger. Cluster settings and pave settings, in particular, can make stones seem larger. Light: The type of light the diamond is viewed in may affect the perception of its size. Natural light is best for getting an accurate view of a diamond. When investigating round diamond weights, couples should always ask to see a ring's certificate or appraisal. While a jeweler may advertise a particular ring as cradling a one carat gem, the diamond industry permits a certain leeway for advertising gem sizes. In fact, a one carat gem may range from roughly .96 to 1.07 carats, and while the differences may not be visible to the naked eye, they can be significant in terms of cost. Furthermore, the style of the engagement ring, metals used, and the intricacy of the design also play important roles in determining the final cost. Individuals interested in finding round diamond weights are helping their purchase by becoming informed consumers, but at the same time they should understand that a bigger diamond isn't always a better quality, more luxurious stone. More important than finding a large stone is finding one that is well proportioned, beautiful, and suitable for the finger on which it will be worn for many happy years.